Take a westward stroll on two miles of dedicated, uninhabited beach. 15 minutes to Thomas Drive area (Captain Andersons Marina and restaurant, Pineapple Willys, Schooners (last local beach bar), Club Lavela and Spinnakers);. 25 minutes to Destin for the golf mecca with hundreds of courses. Enjoy chillin' with a cold drink in the outside dining area PRIVATE covered deck conversation area surrounded by tropical plants. 10 steps out front door to a large pool with ample lounges and chairs. This is my dream home....right on the beach. Take 5 steps down from the covered deck and put your toes in the sand, Take 10 steps out the front door and be enjoying a gorgeous pool. Quiet west end of PCB; no high rises just million dollar plus home surround Bonita Beach Condos (only 20 units)! Out of the 20 units, most are 2nd homes and non-rentals. Uncrowded beach....many times you and maybe 10 other people enjoy this gorgeous stretch of sugar white sand. Just west of BBC is a 2 mile stretch of uninhabited beach....no houses. No parking garage; park at the front door; no steps and you can even roll your suitcase p to the door via a wooded ramp and walk way. No stairs in the condo....all one level! THIS IS MY PIECE OF HEAVEN AND I WANT TO SHARE IT WITH YOU! Multiple bar glasses: champagne, wine, margarita, martini & bar tools. Lots of room and all the amenities you need. Awesome porch overlooking the ocean. Great place for family vacation. Beautiful location steps from the sandy white beach. Even though it was spring break, the beach was private and we had plenty of space. We enjoyed waking up to a cup of coffee and watching the ocean waves roll in right from the porch. We also enjoyed a glass of wine in the evening and watching the sun set. The condo is well appointed- everything you could need is provided. It was spacious and clean and exactly what we needed for a week at the beach. Amazing condo in prime location for our family vacation! This condo was the perfect place for my family of 4 (from Texas) to meet up with my parents (from Indiana), and my brother-in-law and his girlfriend (from Georgia). The 2 master bedrooms and baths were beautiful and spacious, along with the double queen guest room that allowed for my husband and me to share the room with our 2 children. The condo comfortably accommodated all 8 of us. We enjoyed sitting on the deck every night just steps away from the ocean. The views were breathtaking, and we had the beach practically to ourselves. We were just minutes away from shops, restaurants, and the pier. We will definitely book this condo again in the future! Thanks to the Texas, Indiana & Georgia family! Please come again! Thank you & please do come again! We so enjoyed our stay at Bonita Beach. Carol was great to work with and we had no problems at all. Loved the few steps it took to get to the beach and the views from the condo’s back deck were AMAZING!! It’s a great place to relax and read a book! The only downside was the pool wasn’t on the beach side, but we loved everything else. Condo was equipped with everything we needed. Would definitely stay again! Thanks so much for for a great review! The pool on the front side of the condo not the Beachside usually is deemed as a plus. Most renters have expressed delight that they take 5 steps off the 40-foot covered deck onto the beach & do not have to cross a pool deck. It was a great week at the beach!! I would recommend to anyone looking for a great place to stay and great view. Carol is wonderful!!!! The only thing, which is minor, is the path to the beach. It is somewhat narrow at the beginning. I plan to make reservations for next year!!! Thank you so much for your review. Yes a narrow path from the rinse off/shower platform through the sea oats! Trying to preserve our sea oats after wipe outs from past hurricanes and high tides. 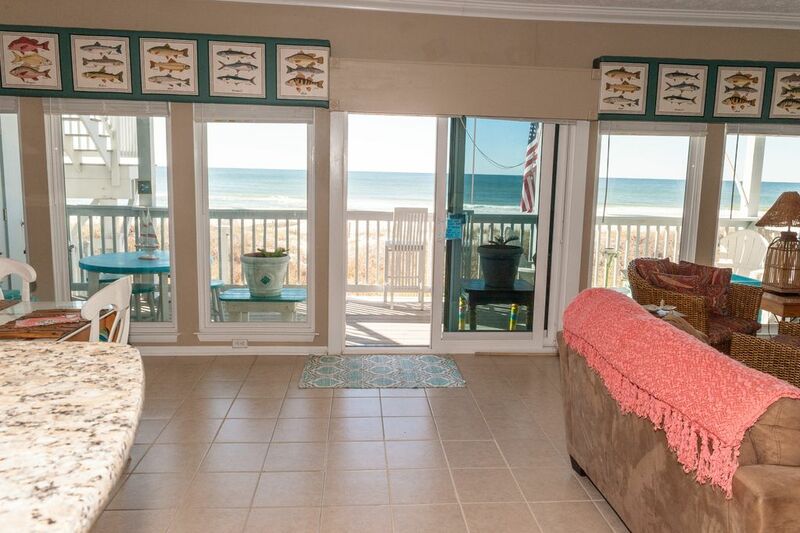 We love having the direct beach access with just 5 steps off the deck onto the beach..